Traditional lemon pickle is very special in every house, in olden days our ancestors preserve lemon for about 6 months to one year, without oil or spices in it.This is used not only as a pickle and as medicine for vomiting sensation and indigestion,a bit of this pickle with kanji is suppose to give as a mild food for fever and easy digestion. This lemon pickle with neeraharam( rice preserved water) and diluted butter milk with little mashed lemon pickle is best during this summer season.They work beautifully preserved this way.It has wonderful aroma which makes our intake more. I learnt this method of making lemon pickle from my mother- in- law,she always prefer this pickle with curd rice, excellent combination. Whenever you feel to have it spicy, take a portion from it and mix with some chilli powder,roasted methi or mustard powder and season it with sesame oil mustard seeds,hing and curry leaves. 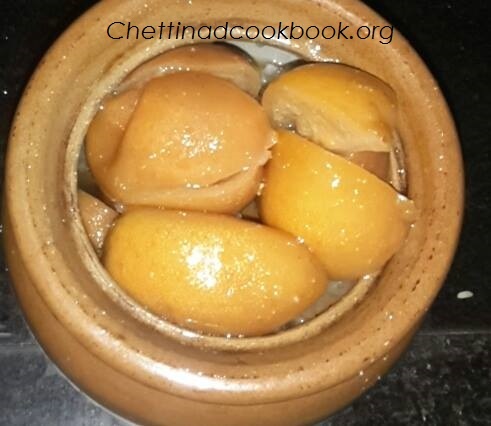 Follow this simple method of making lemon pickle and utilize the benefits through out the year. 1.Powder the crystal salt measured. 2.Put 2 tablespoons of kosher salt at the bottom of your canning jar. 3.Rinse and scrub clean the lemons. With each lemon, cut off any stems. Cut off 1/2-inch from the tip of the lemons. Cut the lemons lengthwise in half, but keep the lemon attached at the base, do not cut all the way through. Then make another cut the same way, as if you were cutting the lemons into quarters, but not all the way through.As shown in the picture. 4.Stuff the powdered salt in to it as much as you can,carefully. 5.keep it in the direct sunlight for 3 to 4 days by covering the mouth of the jar by thin white cloth. 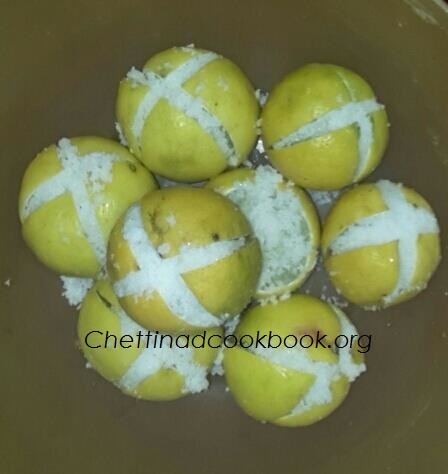 6.Juice from the lemon will coagulates with the salt added, to get soaked perfectly. 7.It becomes soft in due coarse time. Ready to serve in 25 to 30 days.